A heinous crime. An empire in turmoil. And a modern girl at the center of it all. Darkness has fallen on the Marinossian family, leaving ruined lives in its blood-stained wake and leaving Annika to pick up the pieces. With a deadly doppelgänger still loose and most likely in deadly pursuit, she's escorted back home to wait out the storm and heal her broken heart...however long that may be. But when she makes a shocking discovery, she'll do whatever it takes to make things right. A world away, Talvi has been dragged to the desolate prison on Bleakmoor Island where he awaits trial for murder. His time in solitary confinement has pushed him to the brink of madness. He starts seeing spirits in the shadows and an angel with red hair. The only thing keeping him from completely losing his mind is the mysterious outlaw in the cell across from him. He's one of the Näkki - the dark elves who were banished from his country for seducing demons to gain their powers. As Talvi gets acquainted with his new friend, he catches a glimpse of the black magic gift that's reflected in his demon eyes. Talvi also learns another version of his country's history that makes him question his convictions. Is the oath he made to his country worth the sacrifice he'll have to make in order to keep it? He vows to get some answers...if he ever gets out alive. The bigger question for Talvi: Will Annika be there if he does? The Darkest of Dreams is the fourth installment of the Annika Brisby Series. It will not be the last. Tragedy has struck! Anika has lost two people she loves more than anything over a heated argument that went too far. Struggling with the loss of them both and feeling like everybody blames her, she is banished back to her world. As she picks up the pieces and begins to heal and move on with her life, she discovers something that throws her world upside down and leaves her to question everything. I just can't believe I finally have the continuation of this story. I feel like I spent between when I finished book three and when I started reading this book completely yearning for more! That should be on the cover of this book. "Prepare to be completely sucked in and absorbed by this story." This is now definitely one of my favorite series of all times. I never want to see it end. I do have just one tiny criticism about the book. There are parts of the book that get a bit repetitive Just little paragraphs that could use a bit of re-wording. Not really many that I could tell. Then again, I was so absorbed in the story I can't really keep track. The narrator was fantastic as well. I give this a full five-star rating. It's one of the best series I've ever read. I will definitely be going back and re-reading this series multiple times. I just know it! If you're interested in fantasy novels with thrilling drama, this is a perfect book for you! Warning, this book does contain adult content and language. I can't wait to see what the future holds for the whole Marinossian Family..
After waiting so long for this book to come out I can’t believe it’s already over!!!!! It’s Absolutely ridiculous how fast the chapters flew by!!! As always the story kept me hanging on every word, with this author I can never guess what will happen next. Excellent read, I will not give away any spoilers. Just read this series- they are all fabulous. Hurry on the next installment... PLEASE! This was amazing! The story kept me in the edge of my seat. Sometimes I found myself talking to the characters out of frustration 😊. I am so glad to see the development of Finn, and Talvi’s relationship growing more mature and Annika and Talvi’s. You’ve GOTTA listen/read this! Love Nick Cracknell’s voice as a narrator he really brings this story to life! I love this series somehow I missed this book release until now. I am kinda dissatisfied with the ending of the book I feel they didn't have any real issues rather than talvi going to jail and getting out. I wish it had been longer to make something truly happen and leave a cliff hanger. I wouldn't change the part that was already written just wish it was longer. Emigh has set us up nicely for the next book though. This review is based on an audiobook that I received. It is an honest review and the complimentary receipt of it in no way affected my review or rating. 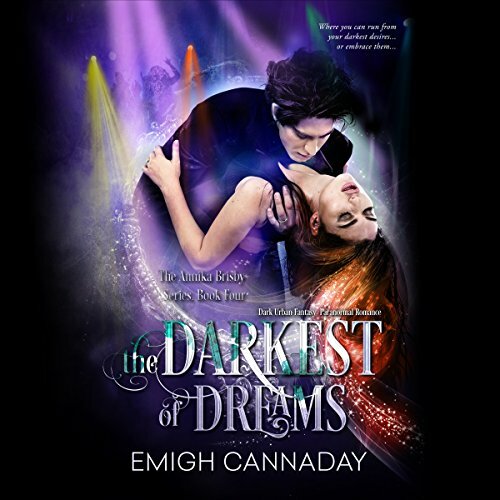 'The Darkest of Dreams' by Emigh Cannaday is the story of Annika and Talvi. This is audiobook 4 in "The Annika Brisby' Series. This audiobook is about 12hours long that does have an open end that is setting you up for the continues story of Annika and Talvi. I have been anxiously waiting for the release of 'The Darkest of Dreams' and I can’t tell you how amazing it was to get this audiobook into my hands! The previous book in this series, 'The Scarlet Tanager', was left on a cliff hanger. So I was excited and curious how the story would continue. Emigh loves a good cliff hanger. But who doesn't? I had a feeling that it was't what it looked liked at the end of the previous book. But I need to listen to this book to make sure. If was right or not. It is now clear to me that the Annika Brisby series is the kind of series that you must read from book one, as the story builds from that foundation. There is are plots that are carrying through the books. Also, it is an amazing series with great personal growth for the characters involved, not just the main characters, and it just makes the stories very satisfying reads! There is little of the romance element to this story. I think that is because of the serious setting this story plays out. In addition, there is a political subplot that is slowly unfurling that involves more than one race in this world. I am excited to see where the everyone is placed in the next part of this series! Overall, 'The Darkest of Dreams' was an amazing journey for Annika and Talvi and I can’t wait to see where this story goes next! The one thing I didn't like was the story was sort of split in two. A part 1 and part 2 what didn't melt well together in my point of view. why have the same name for a leading character in 2 different series? If it is the same person it should be notated SOMEWHERE the correct reading order to avoid confusion. Finally we get more Talvi and Annika! I have loved every book in the series but The Darkest Dreams is my favorite! I just can’t get enough of Talvi and his swagger and just his personality! This is such a great addition and complements the book so well that it is a must! Emigh Cannaday is a brilliant writer and I can’t wit for what comes next! I am voluntarily leaving my honest review after listening to this arc audible book.